The week is flying by as we are packing in as much fun as we can down here in sunny Florida. Every day has been full of sun with a wonderful ocean breeze to keep things pretty nice. Doesn't everybody fish in a tiara and pj's? We enjoyed a family bike ride down Tropical Trail where there are gorgeous houses on one side and river on the other with palm trees lining the road. Zoe got to take a ride on her cousins paddleboard and she absolutely loved it. They went up and down the river while daddy kayaked beside them. Dave tried his luck on the paddleboard, but he didn't fair too well. He ended up just a little bit wet!! 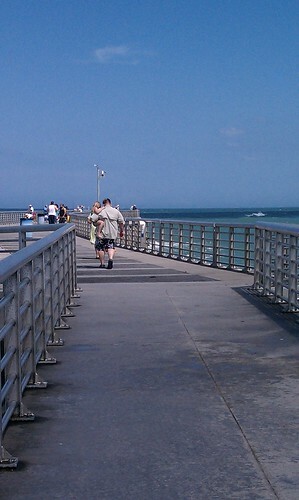 Yesterday the day was spent at Sebastian Inlet where there is an awesome tide pool perfect for waders like us. 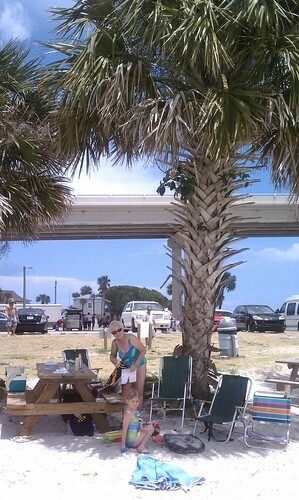 We set up camp at a picnic table right under a shady palm and enjoyed the afternoon. 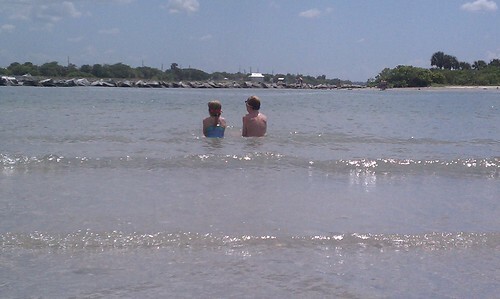 The kids loved it when the little waves washed them over. 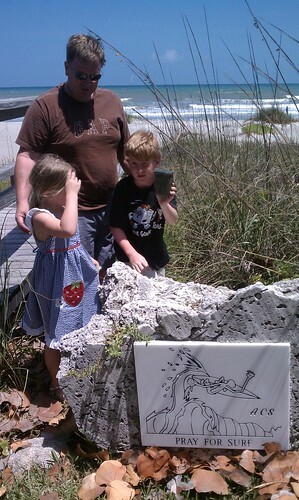 We were thrilled when we saw that a group of manatees joined us in the tide pool. Unfortunately I didn't get any pictures, but I swear they were enjoying all the people attention as they swam very close and waited for people to pet them. They are some big, beautiful creatures. We've also done a bit of geocaching while we've been here. We haven't found the motherload yet, but we found one with a few treasures and a bunch of others that we got to sign our name too. 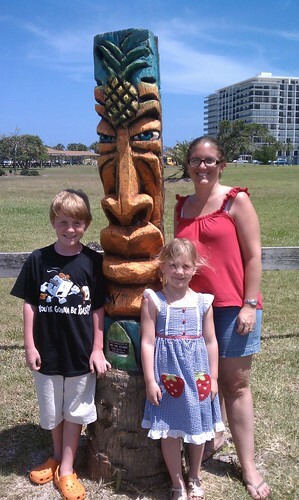 One was near this tiki god which we just had to have our picture taken with...okay I had to have the picture with and the kids just pacified me! So our days have been full, our nights relaxing, and much fun has been had. This vacation is just what we all needed. A few more days to go! I wonder what's in store for us next?